Skip MacCarty (Andrews University, Pioneer Memorial Church) defends the Seventh-day view, which argues the Sabbath commandment is a moral law of God requiring us to keep the seventh day (Saturday) holy. It must therefore remain the day of rest and worship for Christians. Jospeh A. Pipa (Greenville Presbyterian Theological Seminary) backs the Christian Sabbath view, which reasons that ever since the resurrection of Christ, the one day in seven to be kept holy is the first day of the week. 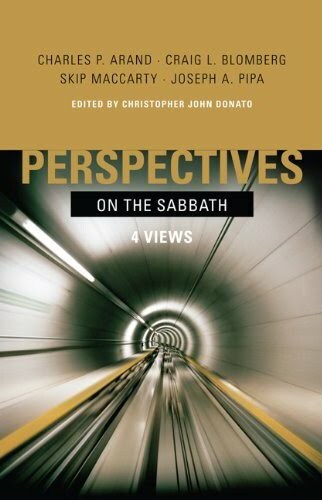 Craig L. Blomberg (Denver Seminary) supports the Fulfillment view, which says that since Christ has brought the true Sabbath rest into the present, the Sabbath commands of the Old Testament are no longer binding on believers. Charles P. Arand (Concordia Seminary) upholds the Lutheran view that the Sabbath commandment was given as Torah to the Israelites alone and does not concern Christians. Rest and worship are still required but not tied to a particular day. Comes out 2011 and I cannot wait for the read!